Nintendo isn’t the only console maker with big things planned for 2017. In addition to its cloud-based Game Pass service coming this spring and the amped-up Project Scorpio landing this holiday season, Microsoft has a new Tech Series of Xbox Wireless Controllers making its debut today. Bree White, Global Product Marketing Manager for Xbox accessories, said that in developing the Xbox Wireless Controller – Recon Tech Special Edition, they were inspired by military technology and performance patters and explored concepts stemming from combat armor and sci-fi mechanical gear. 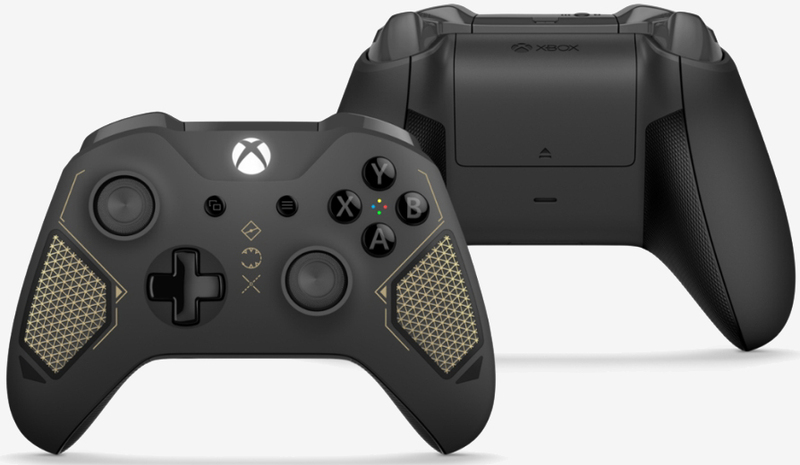 The controller features a laser etched texture, gold accents and insignia are on the front and a textured diamond rubberized grip for added control and comfort on the rear. Like other Xbox controllers, it features Bluetooth technology for gaming with Windows 10 devices and Samsung’s Gear VR. There’s also a custom button-mapping feature one can use through the Xbox Accessories App. It can even be used with Copilot, a console feature that allows any two Xbox Wireless Controllers to act as if they were one. The latter feature sounds especially appealing as it could help out a ton with those needing assistance – a parent helping their kid learn how to play or someone assisting a friend who has a physical disability. Copilot will be added later this year in the Creators Update. The Xbox Wireless Controller – Recon Tech Special Edition goes on sale worldwide on April 25 priced at $69.99. That’s a premium of $10 over a standard Xbox Wireless Controller.